A photoshopped picture of Lady Diana with Kate Middleton has gone viral and it has split people down the middle as to whether it is beautiful or distasteful. The image features the late Princess of Wales bending down to admire Princess Charlotte who is in Middleton's arms at her christening. The picture was originally shared online by Lori Vi Eastwood with the caption "A mother's love... lasts forever". It was later shared on Facebook by Mary Kohnke from the United States who said "What a great job at photoshopping ... Let's make this go viral!" Since then it has literally gone viral and Kohnke's post has been shared over a quarter of a million times as commenters responded with how much they either love or loathe the image. One poster said "This is a lovely sentiment. miss our Princess Diana" while another disagreed completely commenting "This is morbid!" 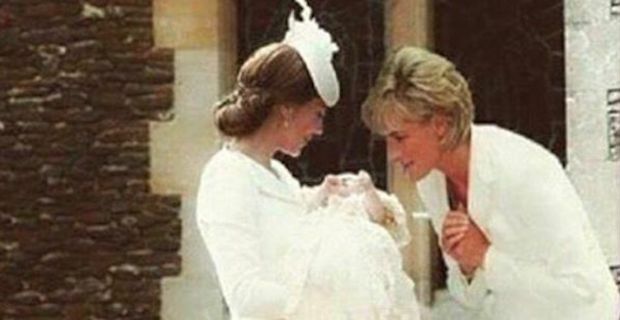 For many, the picture touched their hearts at the thought of Diana enjoying spending time with her grandchildren. One commenter summed up this side of the argument succinctly saying "Two incredible young women, she will be a great mom...she would have been a fabulous grandmother." The image of Diana used was of her at a meeting with Mother Teresa in New York in 1997 and is coupled with Kate holding Charlotte at St Magdalene Church in Sandringham in July. The Princess of Wales died tragically later that year after she was involved in a car crash in the Pont de l'Alma road tunnel in Paris.